Marketers risk talking too much to ourselves. As demonstrated at Cannes, SXSW, and every other festival where marketers congregate, there’s a well-insulated marketing echo chamber. 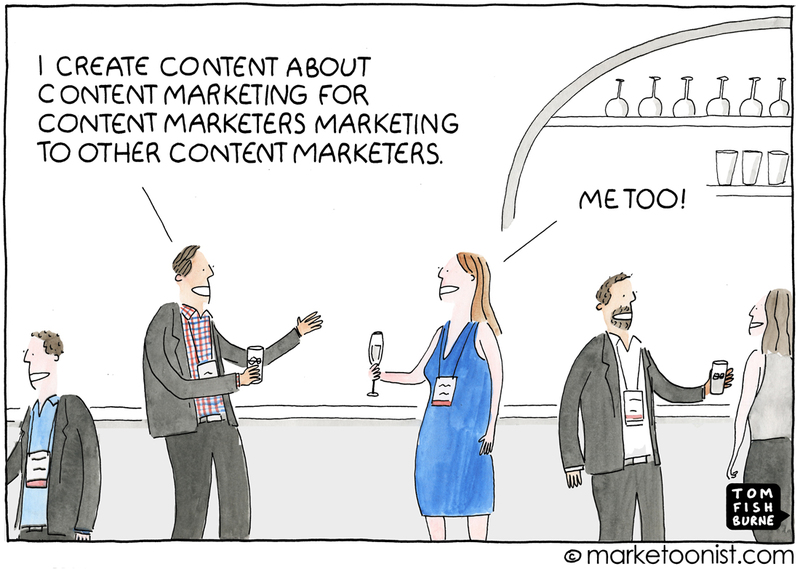 Nowhere is this more prevalent today than in content marketing. The sheer glut of new content created every day is deafening, and much of this content is created on the topic of the content marketing industry itself. 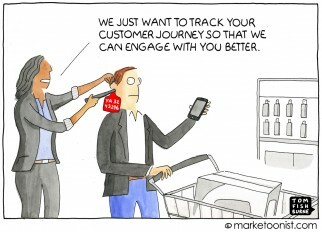 What often gets ignored in the marketing echo chamber is the actual customer. We can get so enamored by the hype of the industry we work in that we can forget why we’re in this industry to begin with. If we’re not careful, we start to breathe our own exhaust. In one of my first marketing jobs, our CMO told the marketing team bluntly that we had to get out of the marketing ivory tower. I was marketing yogurt, and was constantly neck-deep in Nielsen data, PowerPoint slides, and agency pitches. Our CMO asked me the last time I’d simply stood in the yogurt aisle of the supermarket and watched how people shop. I realized how much my vision had been clouded by marketing myopia. Our CMO urged us to to take time every week to step out of the echo chamber. Years later, I interviewed for a marketing job at Apple, and the VP who interviewed me told me that he worked a 2-hour shift at his local Apple store every week so that he could talk to customers directly, without the marketing filter. The customers he waited on never knew he worked in marketing. I think it would benefit all marketers to find the equivalent of standing in the yogurt aisle once a week. It takes a concerted effort to mute the sounds of the marketing echo chamber. This is so true. Since I turned to consulting I have found myself being drawn in by this issue. Thank you so much for this great reminder. Very well put. If you follow marketers on social media, you find that most of them are telling other marketers how great marketing is and/or trying to teach other marketers abt marketing. No real conversation that touches customers take place there. So what else is new? The bigger a business gets, the farther from its customers it drifts. The owner of the corner store knows what each of his or her patrons likes. The CMO of a monstercorp knows only what aggregated, impersonal data implies. Even the most sophisticated polling, purchase history analysis, focus grouping — and occasional in-shop observation — yield only generalities. Large enterprises are by the very fact of their largeness doomed to guessing what the majority of their potential customers really want to buy. My yoghurt aisle story is when I worked in magazine publishing. Standing on the London Underground watching people flick through their magazines was a revelation. Seeing how they browse, I realised something important about magazine layout – the less there is on a page, the faster people flick from one page to the next, before they get to the end. This is before they actually read anything. I realised that a magazine with lots of boxes, snippets and photo captions took longer to flick through. They would stop at things that catch their eye and I realised that there is a psychological benefit to having a magazine full of eye-catching box-outs, photos and snippets. For the browser, it feels like there is more in it. This is so absolutely true!! Even beyond the store aisle. In our marketing team, we used our consumer database to set-up in-home interviews, in consumer homes. A maximum of 3 marketers per team would go to one home. Each team visited 3 home. We sent an email to registered consumers in a given postal code telling them of our intentions. Of those who were interested, we contacted them directly and organized visits. We even did store visits with them. Sooo easy to organize (albeit time consuming). I worked in “thought leadership” for years in the management consulting industry. In 2003, my boss blanched when I said the research we produced was “marketing” – he thought it was more pure and academic than warranted such a crass characterization. 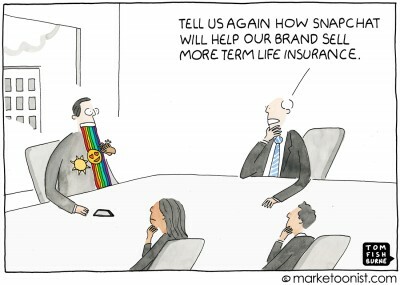 But marketing it was… and in that time frame… very effective. At the same time I was Publisher for thought leadership, I was also a working consultant… selling and delivering projects. I knew what I was publishing was Marketing, but I needed to stay tied to the reality of my readers (i.e., future customers). When marketing professionals get together they talk about their profession. What works and what doesn’t. Just because you don’t hear them talking about customers doesn’t mean they don’t know whom the buyer is and the reason they buy. With that said though, yes there is a lot of content produced that doesn’t hit the target. And yes, more exposure to the customer (trade shows, customer advisory boards, sales calls, focus groups, visits to retail locations, etc.) will improve their understanding of the customer and will result in better content. This is a great observation! There is so much content marketing info pushed out there the wave is definitely breaking down. Difficult for those who really want to be heard above the noise. Stay focused. Stay great. Stay different. You will be heard. On point, as always. And Mark A is genius-level when it comes to cutting out the shiny or over-analyical and focusing on the root of what matters – pleasing the consumer, in hopes that they remember you, feel an emotional connection, and buy what you are selling again. Keep it coming. The industry needs a reality check. This applies to B2B as well. This is why I love sales people in B2B. Marketers in the B2B should sit in on sales calls and listen to the customer. This gives you insight on real problems they are looking to solve. If you truly want an edge as a marketer, put on the customer’s ballcap and view everything you do from that lens. Then, and only then, will you come up with winning strategies that truly effect customer lifetime value. Spot on. Thanks for the reminder. Here’s a simple but effective strategy: clear out your inbox. Unsubscribe from all those marketing email lists you joined and start over. There’s great relief in it.